Stone's Imperial Russian Stout has hit area shelves, and the timing couldn't have been better. I love drinking a 10.5% Imperial Stout with temps in the 90's, just lounging around the pool while midget hookers slather me with sunscreen. Not Stone's fault for the late release, though. The beer should have been here a month ago, but issues beyond their control held up the process. And we get two versions this year: the old standby and a new version using Belgian yeast, with additions of star anise and oak chips. Both of the 22 oz. releases retail for $6.99. 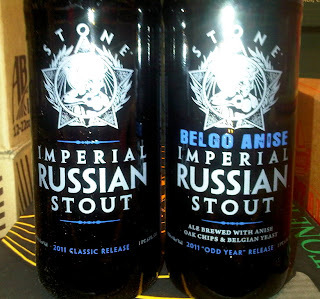 Don't be afraid to wait for cooler weather to try this one out- Stone's IRS has always been one of the hoppier Imperial Stouts and is good both fresh and with age on it. Just don't fall asleep by the pool after drinking it- those hookers can't be trusted with your personal belongings. Just saw that Jubilation has the 2009 and 2010 version of the RIS as well. Limit 1. Good tip, thanks a lot!